The route can be logically divided into three parts. 2nd part - Camp2 (6600) to Camp 4 (7500) - the new line on the SW face. The line goes diagonally up-left via SW face towards the W pillar. The team was divided into three groups working on the route in 5-7 day shifts. While one group was pushing the upper end of the fixed ropes further, the other two groups were involved in load carrying to high camps. Each group had 2-3 days of rest in the BC after each working shift on the face. Ropes were fixed all the way up to 7800m. 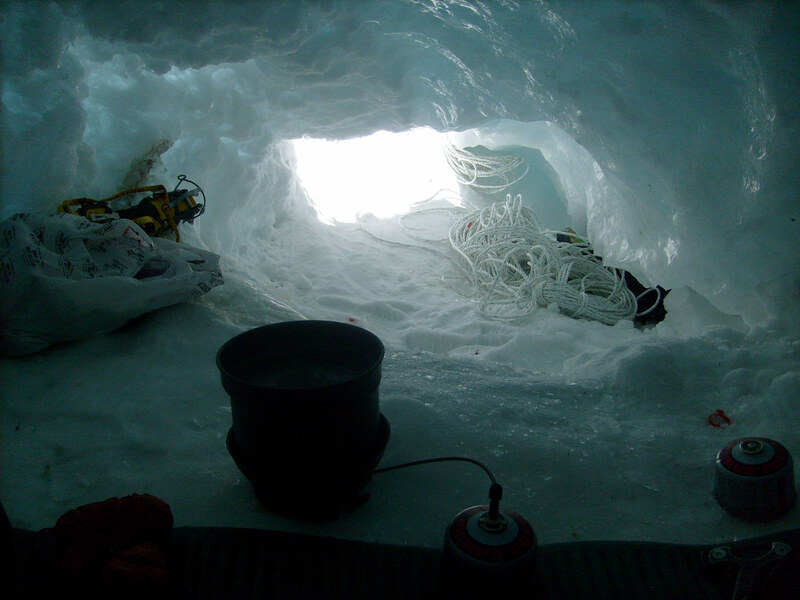 The bottom line of the fixed ropes was at 6000 - in the beginning of the steep ice slopes between ABC and Camp 1. 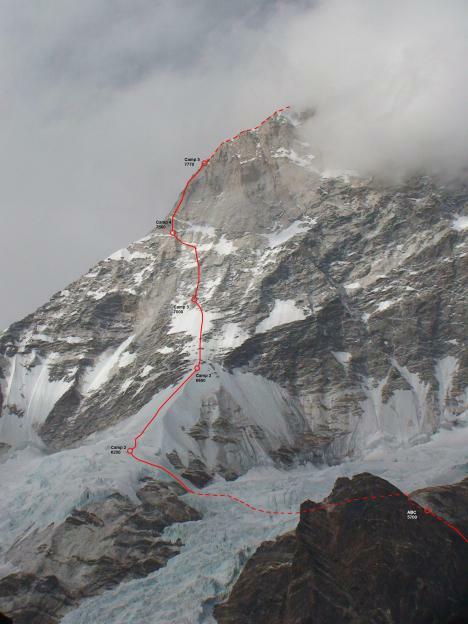 Total length of the fixed ropes used - 3000 m.
The main technical challenge of the route was the slabby second part of the face from 6200 to 7600 to the left or Slovenian route. This part has never been climbed before. Rock above 6600 is polished, protection is generally bad. 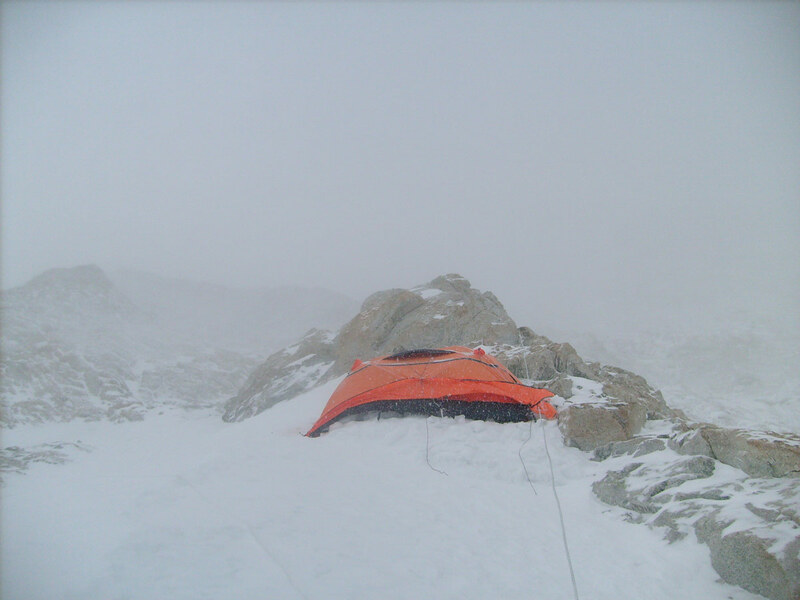 There are no ledges suitable for camping except the tiny ledge used for Camp 3. However, no bolts were used except one at Camp 3. 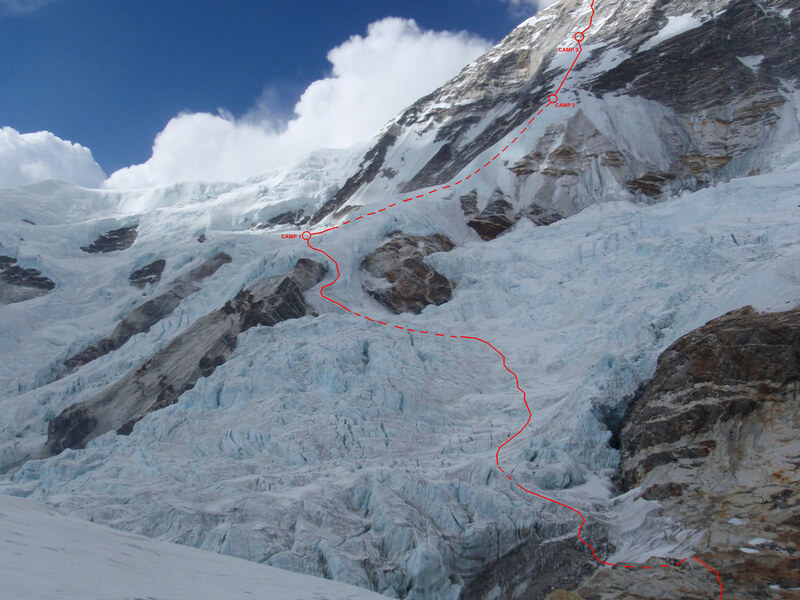 The average grade of the second part of the route is 4-5 (UIAA) with one pitch A1-A2. 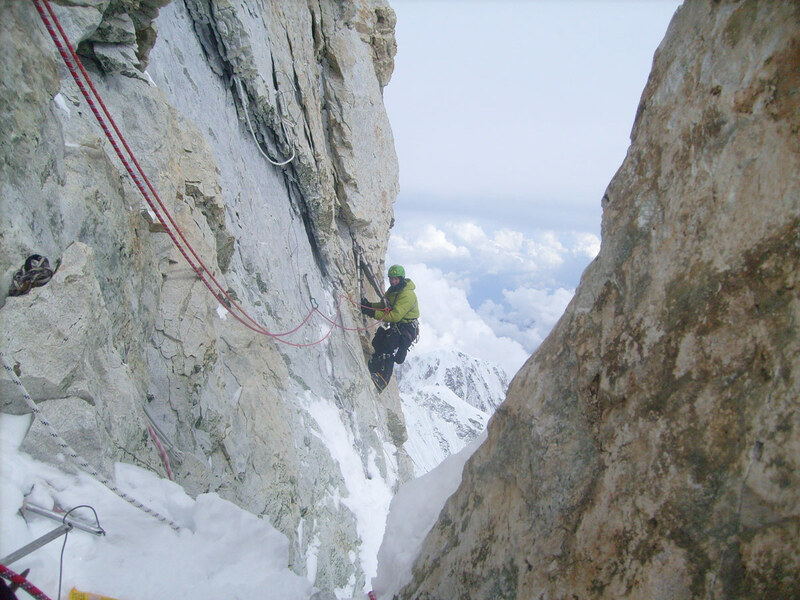 The crux pitch after joining the Wester pillar was at well known A1-A2 30m rock wall at 7700. 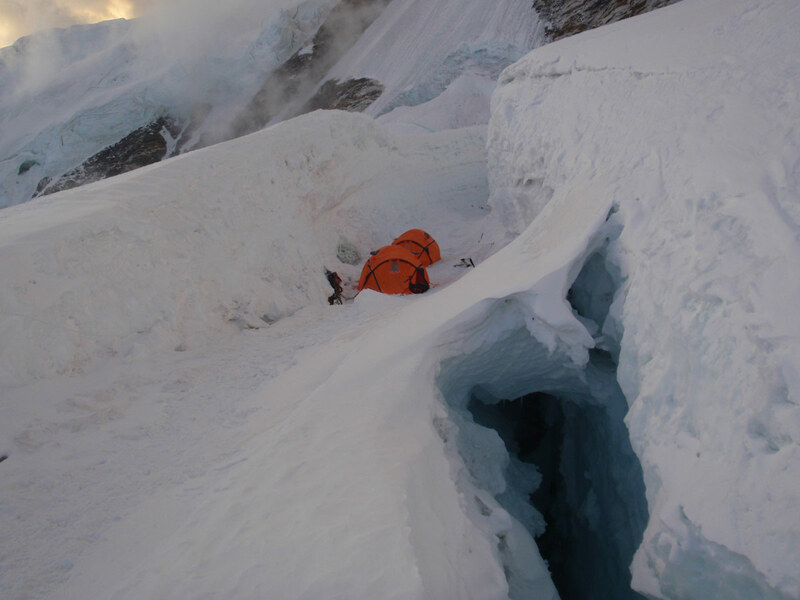 Main difficulty experienced by the expedition was the forced 11 days gap in our activity due to high winds on the face (up to 140 km/h). 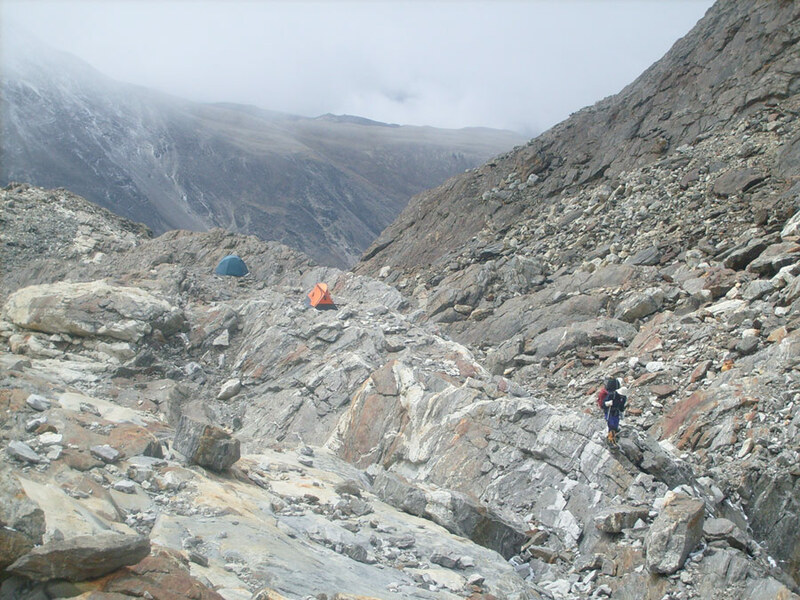 The team had to re-establish almost all high camps. 1 tent was blown out in ABC. Camp 1 tent was partially destroed. Camp3 tent - partially destroyed. Camp 4 tent was completely destroyed. The replacement tent was also destroed after just two days and replaced with the third tent. There were 3 summit attempts (one by each group). Only one group got into the only weather window and managed to get to the summit on 23/04/2010. Descent via normal route was choosen.